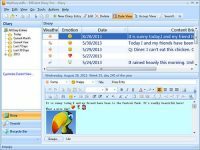 Efficient Diary is a cross-platform, easy-to-use and powerful electronic diary software package which allows you keep a diary on either PCs or mobile phones. With its unique and powerful flash full-text search technique, you can simply enter a word in the diary to quickly find the corresponding entries! The product has a strong edit function similar to that of MS-Word. A happy life can’t be without Efficient Diary! Thanks for all of you! The happy life can be with another program. I don’t like the interface of this Efficient diary, besides it can not use unicode.